Cash-in-transit is the process whereby Guardsman SVG Limited collects our clientsâ valuable packages and, following the proper documentation procedures, either takes these items to the bank for deposit, or after banking hours stores them at our location, which houses an overnight vault with guards on duty 24-hours every day for added protection. Each operating vehicle and all assets are fully insured, thus taking the burden off business houses in securing their hard-earned monies and/or valuables. We also offer the service of storage of information back-up tapes to all business houses. Some information is very valuable and can be quite expensive to replace. 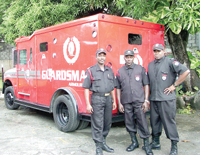 No longer will business houses have to be afraid or risk the lives of their employees when doing their daily deposits, as Guardsman SVG Ltd. offers this service at a time for pick-up as directed by our clients. We are dependable and, in the event that our clients’ requested times cannot be made for any unforeseen circumstance, our back-up staff is on standby for immediate communication with the clients and/or their designated staff.